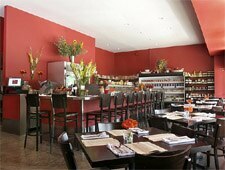 Italian café serving an array of charcuterie, cheeses, wood-fired brick oven pizzas, meats and fresh pasta dishes. : Inspired by a cube-shaped cheese counter in an Italian airport, Alex Palermo transformed the Divine Pasta Company storefront into a restaurant where his products can be sold alongside an assortment of imported and domestic cheeses and charcuterie. The menu is based on the space’s Italian roots and leans seasonal American. Start with some of the 85 different fromaggi or the salumi, both served on slate plates, bearing in white chalk the names of the food. Of course, all the pastas are homemade and fresh. Harissa added to the broth of the clams linguine will wake up your palate, while the maltagliati (pasta made from scraps and off-cuttings) served in an oxtail ragù is more classical. The four pizzas feature crusts so thin with so few toppings that they taste more like flatbread; we preferred the wild Alaskan halibut on its bed of creamy corn and fava beans succotash seasoned by a tomato vinaigrette. As with the rest of the menu, the desserts change constantly, but don't hesitate to order the s’mores when available. With its sensibly-bold red interior, a list of over 300 Italian wines, and an affable waitstaff, Cube seems to bring some excitement to the increasingly staid wine bar scene. 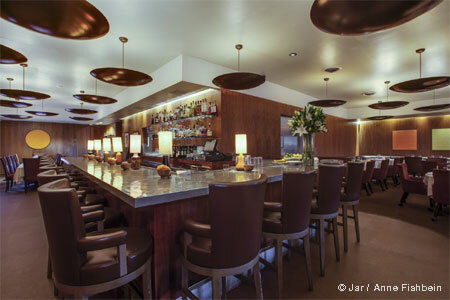 If the noise grows too loud, escape to the few tables that line La Brea.